Umberto Pregliasco was born in Turin, Italy, in 1960. Since 1984 he has been working along with his father Arturo at the Libreria Antiquaria Pregliasco, one of the most renowned antiquarian bookshops in Italy, founded by his grandfather Lorenzo in 1911. From 2004 to 2010 he served as President of ALAI (Italy's Association of Antiquarian Booksellers) and since 2012 he has been in the board of ILAB-LILA (International League of Antiquarian Booksellers). 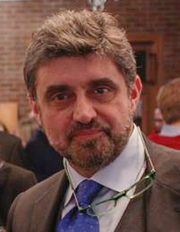 In 2011, on the occasion of the centenary of Libreria Pregliasco, he wrote the pamphlet Living with – and from – Books and delivered a lecture at Columbia University's Italian Academy for Advanced Studies in America along with Professor David Freedberg, Pierre Matisse Professor of the History of Art and Director of the Academy, and Andrew Robison, Andrew W. Mellon Senior Curator of Prints and Drawings at the National Gallery of Art in Washington D.C.
After working often in partnership throughout the last thirteen years with Filippo Rotundo of Philobiblon, he decided to take on the challenge of opening PRPH Books, a new rare books gallery on the Upper East Side in New York City.